Science journalism versus fake news. The Scientific Storytelling project unites scientists and journalists in a collaboration between the Goethe-Institut, the German Academic Exchange Service (DAAD) and the ONA Academy. 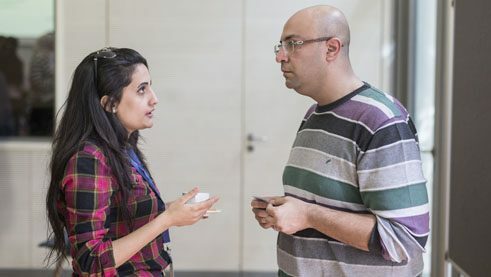 “Dialogue is extremely important,” says Reem Magued, the well-known Egyptian journalist and former presenter on the Egyptian television network ONTV. “Without it, both scientists and journalists believe that the other profession is responsible for the current state of science journalism in Egypt,” continues the current director of the ONA Academy. Science journalism in Egypt is going through tough times. Fake news is just one of many problems. According to Reem Magued, regular meetings could help both professions recognise that they ultimately have a common goal – to bring science to a wider audience outside the academic community. For the project, in mid-February the Goethe-Institut held two journalism workshops and, together with the DAAD, a joint workshop for media professionals and scientists. Unlike the previous year’s pilot project Writing about Science, the Goethe-Institut opened the project to multimedia journalists as well. The exchange between scientists and journalists is very important. | Photo: Roger Anis/Goethe-Institut Kairo “To me, multimedia journalism is a key format in the field of science journalism. Writing, audio, video and photography – these are all different journalistic elements and tools that help explain complex scientific details to the general public and young people in particular,” reports Reem Magued. “And multimedia as a format can help minimise the problem of fake news with its audio-visual elements,” Reem continues. But many interested people lack both knowledge and the money to realise multimedia projects. That was the situation Maha Taha and Aya Ashraf were faced with. The two took part in the first workshop on multimedia journalism. Two years ago, the two Egyptian women set up the website NeonSci, where they report about science in a humorous way using the local Arabic dialect. The idea behind the site is to simplify and make scientific topics easier to understand for the general public, according to Ashraf. “It is not easy for Egyptians to find critical and Arabic-language content on scientific topics,” she adds. Taha, too, is passionate about science and looks forward to exchanging ideas with other journalists and academics. What do you do and why should I report about it? New horizons also opened up in a common dialogue when the organisers adopted the good experiences of the previous year and allowed the two professions to get to know each other. On a joint workshop day, in addition to various discussions, they focused on their different expectations. In discussions, both sides presented what they thought of the work of the other groups so far. From the dynamics and heated interactions Reem Magued, for example, gained the important realisation that the two groups still perceive themselves as two competing teams. But at least the participants of the workshops recognised that they are one big team that cannot reach their common goal without close cooperation. Together, they want to works towards science being presented correctly in the media. After the workshops, the journalists wrote articles or multimedia contributions. The winners of the best results will be honoured and given the opportunity to travel to Germany in April to get to know the field of science journalism in Germany. The Scientific Storytelling project is a collaboration between the Goethe-Institut, the German Academic Exchange Service (DAAD) and the ONA Academy. It is the continuation of the 2017 pilot project Writing about Science.